Just maybe though – you don’t need any more money advice?? I mean, that could be true. I’ve read dozens of personal finance books over the years. I currently read dozens of personal finance and investing articles every week. Heck, I run this blog! Money talk is cheap. Actions speak far louder than words. Kill your debts including your mortgage sooner than later. Establish and maintain an emergency fund of a few months. Make savings (and investing) automatic. Keep your investing fees low. Mind your health. Any money is useless unless you have your health. But behavioural changes are very tough…we’re human and we’re flawed. “As we navigate our lives, we normally allow ourselves to be guided by impressions and feelings, and the confidence we have in our intuitive beliefs and preferences is usually justified. But not always. We are often confident even when we are wrong, and an objective observer is more likely to detect our errors than we are.” -Daniel Kahneman, brilliant author of Thinking Fast and Slow, Nobel Prize winner. We bought too much house for what we really need. We’re changing that though this year. I haven’t killed all our debt yet and we probably could have by now. I used to sabotage my portfolio. We bought a new car many years ago. Buying used would have saved us a couple thousand dollars. It took us years to establish this amount in our emergency fund – I ignored it for a while. I do however know what I need to overcome and work on. This blog is about that journey. It keeps me honest. It keeps things very transparent. It keeps me humble too – sometimes I really don’t know what I don’t know. Mark, I have an ‘interesting journey’. I am a former (I like to joke…still recovering) advertising writer and creative director. I had a reasonably successful career working for major agencies and on major brands. I won my fair share of International and Canadian awards. But I was always obsessed with investing and indexing. So, at age 50 I started a second career, moving to Tangerine as an advisor on their lower fee index portfolios. As I like to joke I cut my income to half to start that venture. My wife says it is not a joke. I did well there rising to the top level and eventually becoming the trainer of the advisors and new hire advisors. I loved that job I stayed there for over 5 years. If cutting my pay in half was not enough, I then cut my pay to zero to launch Cut The Crap Investing – my blog. One day I’ll have to make half a living, my retirement portfolio was only half-ready. While I worked at Tangerine I was mostly in a negative cash flow situation, but I wanted to help Canadian investors. I needed to talk to them on a regular basis. I still ‘talk’, just through a different platform. I guess my journey when it comes to financial independence or any retire early dreams is ‘FIRE light’. Is FIRE (Financial Independence, Retire Early) even right for you? I was able to make that move as my wife and I paid off our house and vehicles. I have a modest portfolio. You can read about that on Seeking Alpha where I write regularly. The personal finance basics allowed this venture. Here is one blogger’s sure fire path to FIRE. In your opinion, why are good behaviours related to personal finance and investing so difficult to sustain? I think on the investing side of things we humans are simply not wired to be successful investors. Especially men. Most people have a terrible investment experience. They either don’t know what they’re doing, and they invest outside of their risk tolerance level, or they make very poor investment choices, trying to get rich quick, trying to hit the home runs. Those decisions usually end in disaster. We are wired to try and make things happen, to hunt and to kill, to force the issue. Successful investing is the result of doing quite the opposite. Let the returns come to you. You have to be patient. Relaxed. All of the successful investors that I’ve known or come into contact with are all very patient and consistent with their money. Investing is perhaps the only area in life where we can do less and get more. We all know of the story of the investment house that reported that the most successful group of investors was the group that forgot that they had investments. Dead people make for great investors as well. Same goes, whether you by index funds or individual stocks. 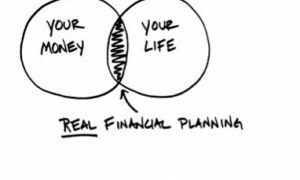 As for overall personal finance behaviour, nobody will wake up today and say ‘I think I need a financial plan today’. They probably should though. Most Canadians have little interest in investing. I think they have a great interest in money but behaviours get in the way and as you say, as humans we’re not wired for investing. Like a new diet and/or exercise regime Dale, what extra motivation can you offer Canadians just to get started? I suggested before Canadians even bother with any investing at all they should do these 3 things. Of course, Canadians should first get their financial house in order. Pay off debt. Build up that emergency fund. Do a personal or family cash flow statement as you say – to see where their money is going – in your link above. I think people would be shocked to find out what they spend, where, and how often. With some simple tracking, people would also be shocked – how small changes can lead into hundreds of thousands of life-changing dollars over many years. I think that’s the big carrot actually. Sitting down and fully understanding that small sacrifices and discipline can add up to make them wealthy over time. Find the money. Invest the money, sensibly. Keep your fees low. Get the heck out of your own way. Let time and compounding do their magic. Keep it simple. If you buy a house or property, then buy it within your means and pay that off. In this post, I highlighted 10 great ways to master your money. How did you master your money? Or, what do you have left to master? Are you aware of your own biases? Mastering money was never an issue. I am not materialistic in any way. My wife is also not a spender or materialistic. I understood the basics very early. My only challenge was initially to make money. It was not easy to break into advertising and it did not pay well in the beginning years. I also went on a business venture that did not end well. One guy stole all the money. I was wiped out at 30 and I had to start over. From there we just built net worth (and that is the number that determines your overall financial preparedness in the end) by paying off our mortgages and debs then investing on a regular schedule. It likely only took us about 15 years to reach the $1,000,000 net worth level. Being an indexer at heart, I understood the value of passivity and consistency – just staying invested and being lazy with my portfolio. I’ll admit it took me a while to move to the level of sloth-like passivity that is required though. My whole investment journey and research has continually and progressively moved to ‘do less get more’. All of my experience, all of my research, all of my observations leads to that simple conclusion. Get out of your own way. Let the returns come to you. Your blog title is “Cut the Crap Investing”. What should Canadians do to cut the crap when it comes to saving and investing? This is easy. Cut the crap spending. Cut the crap on investing in high fee (crap) mutual funds. Invest simply and regularly within your risk tolerance level. Don’t take on unnecessary risks. If you really want to try and beat the market you can buy a U.S. mid cap or small cap fund. In Canada, like you, I like the stable big dividend payers such as the big banks and telco’s and pipelines and utilities. There are some great ETFs as well. Keep it simple. Keep it cheap. Your Dividends and Indexing pages are a great resource. In retirement it’s perhaps even more important to keep the fees low. If your portfolio is designed to pay you out 4-5% of holdings each year, you can’t put 2-2.5% per year in the wrong pockets. While high money management fees still exist – they are going away kicking and screaming. What can Canadians do better? larrybates.ca. It’s shocking. Fees can eat up half or your returns or more over the decades. But I think Canadian investors are turning a corner. More money flowed into ETFs last year than mutual funds. Many of the big financial institutions have been the writing on the wall – they are aggressively moving into the low-fee space in a bigger way. Most Canadians (I would say about 90%) want a managed portfolio. Well, they can go to a Robo Advisor and get advice, digital and human, and then get set up in well-diversified lower fee ETF portfolios. 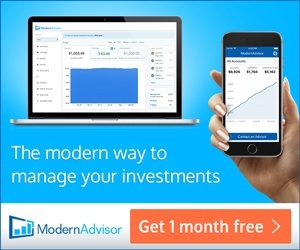 (Mark – you’re right – Hassle-free investing is here with robo-advisor: ModernAdvisor). Heck, you can invest for 0.20% plus ETF fees at Questwealth; there are low-cost options at Nest Wealth and many more including the one above. All the “Robos” are quite different but the good news is, they cover a huge need for Canadian investors now. If you want to follow Dale head on over to Cut The Crap Investing. I’m sure I’ll have Dale back on the site soon. All the best and let me know your thoughts on this post below. 44 Responses to "Cut the crap – smarter saving and investing is here"
First off, anyone in advertising pretty well by definition is in the business of deception in the pursuit of selling something. Second, when I read that a person took 15 years to reach a million, I immediately calculate a per year figure and realize that that is not within the capability of most people under normal circumstances. Then I remind myself of my first point. Sorry, but my cynic warning strobe is flashing on this one and I wonder what is trying to be sold. Having said that, the points about not spending, getting out of debt and saving lots mentioned as a wrap up in the last few sentences are entirely valid. I probably should have just skipped down to that. Hi Lloyd, I understand the cynicism toward advertising, ha. I am likely the opposite of ‘selling something’. I cut my pay by more than half to join the lower fee indexing investment industry. In fact it cost me tens of thousands of dollars to work at Tangerine, I had to use our savings, then spend a small inheritance. But not regrets, while we were in negative cash flow, we were also paying off our house and the second vehicle that had a couple of years of payments. I also had a 14% Group RSP plan, 7% matched. So I was building up some additional assets. House was going up considerably in value. Existing investments were increasing in value. So while in negative cash flow situation for a few years, our net worth continued to climb considerably. All worth it to help Canadians with their financial situation and investments. I then cut my pay to zero to launch Cut The Crap Investing, and to help Canadians. As per net worth to $1,000,000 in 15 years remember that includes real estate and investments. Our Toronto home values increased dramatically, our first home was almost paid off in 5 years. Second home had a small mortgage. Our investments did very well. I had several good years in advertising and saved at a 30%, 40% rate at times. Not difficult in Toronto to get to a $700,000 real estate value and $300,000 or more portfolio in a decade or more. The ‘Lesson’ perhaps is as you suggest and the sentence or two that you like. and it’s simple stuff for anyone. Pay down debt, build that real estate wealth if you can afford to get in, and invest on a regular schedule in a simple fashion and keep your fees low. Everyone’s financial freedom looks different. ‘morning Dale. I have no doubt that some people can achieve a net worth of a million in 15 years, I am just skeptical (a bad character trait of mine) that it can be done under normal circumstances by most people (I’d likely not consider the Toronto real estate scene to be normal nor reflective of the entirety of Canada). I guess I just see too many of these “look what I did” enterprises trying to sell something, my bad. Hi Lloyd no problem at all thanks for the reply. You’ll see that my site is not based on my financial journey. It’s simply about some personal finance basics and the many low fee strategies that Canadians might embrace. That said, I am a fan of seeing how others reach their financial goals 🙂 Those are inspiring. Get rid or the mortgage….there are different thoughts about that. If that is your only asset class…why put additional after-tax-$$ into that? max out RRSP into a balanced portfolio, use tax refund cheque –> TFSA..more balance. Very fair point. I know a few investors who would rather max out TFSAs and RRSPs – and simply make min. payments on their mortgage – for the reason you noted. That said, I don’t think most folks have a stable job; that would definitely not apply to everyone. Hi shredder on a personal note that’s exactly what we did. We went hard on our first mortgage and that set the table for the future. Our second home mortgage was quite reasonable and we did not accelerate payments. Interest was well below 3%. We moved back to the investment side, and built that up. The investment returns (all tax sheltered) were much greater than the interest rate so it appears to be a good move. Paying off the mortgage was not a big deal. We did not even go out for dinner, never mind throw a mortgage burning party, ha. It just felt like something we were supposed to do. It feels better in the long run not having those mortgage payments. I don’t remember when we achieved net assets of $1M. We didn’t track that back then. I am pretty sure though it took us less than 15 years even if we start counting from the time we put our feet on Canadian soil. I consider us being quite the normal Canadians. As a fact, we had a later start point than most Canadians. We immigrated to Canada being already around 30 years old. It took a few years after both of us settled with our new careers. If I look around at families in similar situations like us, that is, first generation immigrates with decent jobs being here for couple decades, well, it’s actually quite difficult to find somebody with net assets less than $1M. I couldn’t understand my professor when I first went to university here. So I kind of think if we could do this, majority of Canadians should be able to do this too, especially considering they can go to university ten years younger than me and without any language barrier. As for mortgage, I think the basic rule is you don’t borrow too much. Adjusting your life style to your affordability, not stretch your affordability to your life style. I totally agree being mortgage (also any debt) free is a great feeling. Quite the story and an IMPRESSIVE accomplishment May. Kudos to you. Thanks RBull. Actually there are so many first generation immigrates doing much better than us financially. A big number of our old friends and classmates who stay in China are also much richer than us. Both of us don’t have high material desire though and we enjoy our life in Canada and we are proud to be Canadians and we love this country. So I think everything is good for us and I really appreciate the chances I got here in Canada. I think immigrating to Canada is the best decision we made in our life. I still remember I got 4 out of 10 for my first in class quiz. Such a shock for me as I have been an All A student in my entire life. That’s very nice to read on how you feel about Canada and your choice to come here. Our country needs more very good productive and successful immigrants like you. We all know some people who have done better and others worse than we have. Doesn’t matter if you are happy. I am sure you moved yourself back up to straight A’s once the language thing sorted out. I was in China for the first time 3 years ago on a fast paced 19 day guided trip, and some other Asia travel afterwards. Very beautiful and amazing country, but I am happy to live here. Just today I received my clearance on all background checks/references etc for a volunteer role teaching English to new immigrants that have a basic level of English already; through our city library, and am waiting for my first assignment. Hopefully I can help some people. RBull, it’s so nice for you doing this. I am sure you will be able to help lots of new immigrates. Lots of nice Canadian people like you helped us to settle down here and we are very grateful. I am planning to try my best to help new immigrates too once I retired, to repay the kindness we received back to the society. Canada as a country with more and more seniors and without enough babies really needs immigrates and needs them to be successful. Great point about immigration May and for one I fully support it in Canada. Always great to hear your points of view. I hope this works out; and good for you to plan to pay back in that way. May, you are a shining example of what some hard and productivity can deliver. All the success you have is through your own doing. Well done. Totally agree with the mortgage comments as well. Debt is fine to a degree, a necessary evil in our modern world to buy various assets, but it is not trivial and folks can get easily sucked into being WAY over their heads. Pretty evident a lot folks have gotten sucked into it way over their heads with world leading household debt levels. The carnage awaits. May, absolutely right about adjusting lifestyle to income and not stretching for maximum lifestyle. It’s hard for me to relate to the invest vs pay mortgage debate. The 2 mortgages I had (plus 1 other rental property) between ages 25 and 35 ranged from 9.5% to 12%. That’s a pile of interest. The decision of what to do was easy. Fortunately I was also able to max RRSP. On the other hand I’ve yet to meet someone who hasn’t done reasonably well with either strategy, investing early or aggressively paying off debt. Very interesting interview – my wife and I focused on mortgage repayment over investing through the late 90s/early 2000s (5.75% interest). After seeing the tech wreck of ’01, we thought we were smart for paying down a sure thing. With cheaper credit it would make more sense to max out RRSPs/TFSAs, and I wished I had known then that variable rates would have been smarter over the “insurance premium” of fixed. Live and learn. Getting started and making mistakes early sure beats making them later! Congratulations May, well done! Most of the people I have met who have immigrated to Canada seem very focused on achieving financial success in this country. Unfortunately many of those born in Canada haven’t learned the same lessons or don’t have the same motivation. 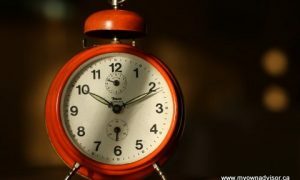 “Getting started and making mistakes early sure beats making them later!” – totally agree! IMO, that was smart. No one *knows* what would happen in the future and I don’t recall anyone predicting the floor to drop out of the interest rates. We paid off debt as fast as we could and I have no regrets whatsoever. I’d do the same thing again with the same parameters. Nothing wrong with killing debt – guaranteed rate of return and less stress – you avoid paying other people first (vs. you). We hope to be debt free in another 5 years. Fingers crossed our plan works out. Thanks, BartBandy. I guess majority of first generation immigrates don’t feel secure financial wise, so they are motivated to word hard and save more. We did exactly the same thing as you, always paid off mortgage or any other debt as soon as possible. A lot has to do with how one grew up, the times, and what one was taught or learned from them. Those who suffered through the dirty 30’s probably always wanted to ensure they had something to fall back on and saved, probably more than needed. Those growing up after WWII, the boom times, at least on this side of the water, just enjoyed the prosperity and savings was low on the totem pole. Now a day, it seems too many get what they want whether they can afford or not (debt 167% of earned income) and don’t or haven’t been through any bad times, taught or bothered to listen. The smart ones may grow up and learn, as you say, and at some point see the light and start making better choices. It is never too late, it just may take a bit more pain to get there. You raise an interesting point – how folks are shaped by their environment. I mean, I grew up in a house where money was tight but my parents had good jobs (nursing) so I guess I learned the value of a dollar early. I started my first job at age 12. My parents still complain 40 years later how they endured almost 18% mortgage interest payments for a few months – they were freaking out I recall – stressed. Smart people, since we all make mistakes, learn from them and pay them forward I find. Folks that don’t want to listen, think they know best, feel entitled, etc. never seem to learn. They are bound to repeat the same mistakes over and over. 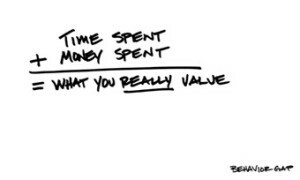 This is my experience beyond finances and investing. Hey BartBandy, no one can blame you for taking the sure thing. As for variable rates I’ve read they win in almost every 10 and 20 year period? If I had a mortgage today I’d go variable. And we might buy a student rental rental house for our daughter as she enters grad school. Might as well have the house pay for itself instead of putting out $800 or $900 monthly. We might be back into that mortgage market. We bought a house for our daughter in Winnipeg when she wanted to go back to school. Two of her high school friends rented rooms from her. Some bickering from time to time but they worked it out in the end. We are thinking about the same thing: buy a condo near the school when our kids go to university. Thanks Lloyd to give live example that it actually works out. It’s still quite further on the way. We will see how house market will do at that time and if the rental ratio makes sense or not, also our financial situation. I’ve never quite understood the fascination with Net Worth. It’s like the value of ones investment, just a paper figure and possibly a feel good thing, if the number is one you feel important. I like the basic things like, no debt, mortgage paid off, money in the bank and real income from my investments. As for Tangerine or any ETF’s, I’ve yet to fine one that provides any real income growth over the long term. With Tangerine you can’t (or I couldn’t) find the distribution history of any of their funds. 1.07% plus .07% for trading or 1.14% fee is not what I consider Low Cost. Though I consider any fee expensive. but that’s just me. I don’t think net worth is a paper figure. Here in BC, the government is collecting more tax from owners of high value property owners. Many of them are protesting as they are rich in net assets ($3M or $4M house) but poor in cashflow. Well, that does not look like a problem to me. Sold you house and move to somewhere else. If you want to stay in the same town, well, townhouses and condos can make nice homes too. High net worth normally means lots of options, and it’s very nice to have. Mo’ money, mo’ problems as they say. High net worth can mean options, better than low net worth, but I suspect those folks that own $3 M or more homes in Vancouver don’t want to move. They should – they have it set and who knows when that party might end. Actually one can, by heloc or reverse mortgage. I am not saying one should, but they are options and there are people doing that. Ya. That is a nuclear approach to being house rich and cash poor = reverse mortgage. I wouldn’t do that unless I was elderly personally and I knew I would be selling my home in the short-term. Heloc for paying bill? NO. But YMMV, everybody has a different situation. I do think borrowing heloc for investment might not be a bad idea although I don’t get enough courage to do that yet. I also still have cash on hand to invest. I will seriously consider to borrow heloc after that. Maybe a small amount, like $50K, to begin with. Basically, my point is, money is money, no matter where it is and in which format. So knowing how much money you have (net assets) does make sense and is important for me. Also, my house right now is where I live, but I also consider it as my kids’ education fund if getting accepted by a top USA/UK university and would like to go. I will miss the ping pong table and the home theater for sure, but education is higher priority. So how much I own this house really makes a big difference. Well, we’re moving in another 6 months. We had a ping pong table in the basement. Gone to my sister’s for their kids/my nephews. I miss that too! Interesting you say that cannew….I have a post coming up about why I don’t post nor really monitor my net worth too much. Sure, no debt is good (something I aspire to), rising assets are good but I can’t live off the net worth of my home. I have to live somewhere. I prefer to have income-generating assets that provide tangible cash flow. That’s what builds that net worth and sets up your financial readiness. Higher net worth and no debt delivers options. Talking about let return come to you, MRU and CNR raised dividend today by 11% and 18%. I hold both, really feel good to get some raises. I am counting on dividend raises to offset inflation in the future when I retired. Absolutely May! I hold CNR, not MRU….yet! MRU, CNR did pretty well for me with some good capital gains. I hold them because I consider myself still in accumulating phase, so I want some growth and I don’t care that much about enough dividends to live off, YET. Once I approach retirement I think I might trim these two and switch to higher yielding stocks. Smart, re: asset accumulation phase. Keep cheering for lower prices! Great read, Dale, Mark. When will our Canadian school system start teaching our kids this wisdom? It’s almost too late when kids are young adults and investing marketing has fogged up their thinking. With all the new tools now available for self directed investing, young people could use some guidance at the beginning stages. 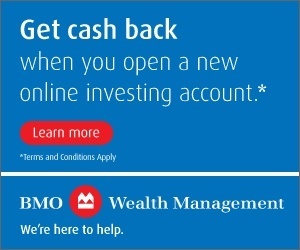 Blogging is great, and ads from investment brokers on BNN are great, but they often attract only seasoned savers/investors. Keep up the good work. Your work will reach school teachers and professors, if not already! With all the new tools, FinTech, Robo-Advisors, etc. there is almost no reason why young folks don’t have all the low-cost, easy to access information they need at their fingertips. The challenging part for them is a coach or guide to put information into context. Human interaction is still required I believe.